As we have since July 2006, each Friday we’ll post our sampling of cigar news and other items of interest from the week. Below is our latest, which is the 521st in the series. 1) Avo is once again adding to its Improvisation Series. 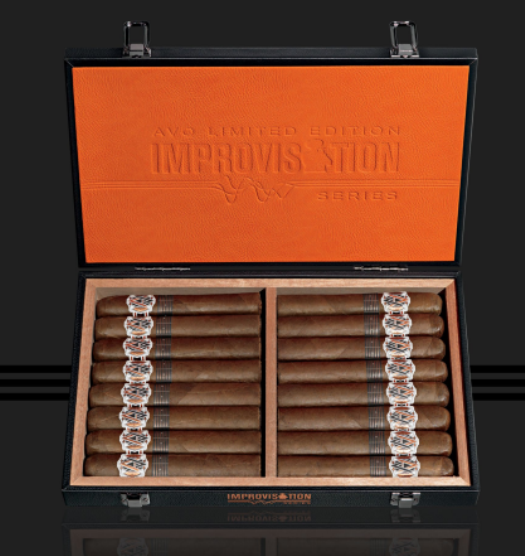 Avo Improvisation LE17 is a combination of three previously released Avo cigars: Syncro Nicaragua, Syncro Nicaragua Fogata, and LE05. “The new blend utilizes the same variety of Dominican binder and filler tobaccos that were featured in the Avo LE05, blended with the same Estelí filler tobacco used in the Avo Syncro Nicaragua Fogata, and presented in the 6 x 60 boxed-pressed format of the Avo Syncro Nicaragua Special Toro,” according to a press release issued by Davidoff, Avo’s parent company. Avo Improvisation LE17 is the first Avo limited edition to be presented in a box-pressed format, and the first to feature a ring gauge of 60. The super-premium, Habano Ecuador Marron Claro-wrapped cigar will retail for $18 for a single cigar or $288 for a box of 16. It will launch on March 22 with a limited production of 2,000 boxes available for the U.S. market. European and other markets will launch shortly thereafter. 2) C.L.E. Cigar Company this week announced the continuation of the Eiroa The First 20 line with the Eiroa The First 20 Colorado, which will begin shipping on April 3. The Colorado is a continuation of the Eiroa The First 20 Line that was officially launched in 2016. “I absolutely love the authentic Corojo seed and finally, after decades of trying, I finally have the exact Colorado color I have been looking for my entire career”, says Christian Eiroa. “I want to share these with guys that actually appreciate the work involved. We are not looking to make millions of these, just the right amount of cigars for the right people.” Each of the cigar’s four sizes will be packaged in boxes of 20 and retail in the $12.36 to $14.36 range. 5) From the Archives: People primarily think of four or five countries when it comes to cigars, but the list is far deeper. Last year, we counted down our top ten cigar countries (and noted some countries that could have made the list but missed the cut). Check out six through ten, then the top five. 6) Deal of the Week: The Tatuaje Reserva Broadleaf Collection is 100 cigars (ten each of ten sizes) all made in Miami. The $1,200 price tag makes it a major splurge purchase, but with only a limited number available, we wanted to highlight the availability of this rare item.